Researchers have found a way of controlling the thermal conductivity of 2D materials, a development that will allow designers to dissipate heat in electronic devices made from these materials. Two-dimensional materials have a layered structure, with each layer having strong bonds in plane, and weak bonds out of plane. These materials have unique electronic and chemical properties, and hold promise for use in creating flexible, thin, lightweight electronic devices. For many of these potential applications, it’s important to be able to dissipate heat efficiently but challenges arise because in 2D materials heat is conducted differently in plane than it is out of plane. In TMDs (transition metal dichalcogenides), for example, heat is conducted at 100 watts per meter per Kelvin (W/mK) in plane and 2W/mK out of plane, giving a thermal anisotropy ratio of about 50. To better understand the thermal conduction properties of 2D materials, a team of researchers from North Carolina State University (NC State), the University of Illinois at Urbana-Champaign (UI) and the Toyota Research Institute of North America (TRINA) began experimenting with molybdenum disulphide (MoS2), which is a TMD. According to NC State, the researchers found that by introducing disorder to the MoS2, they could significantly alter the thermal anisotropy ratio. The researchers are said to have created this disorder by introducing lithium ions between the layers of MoS2. 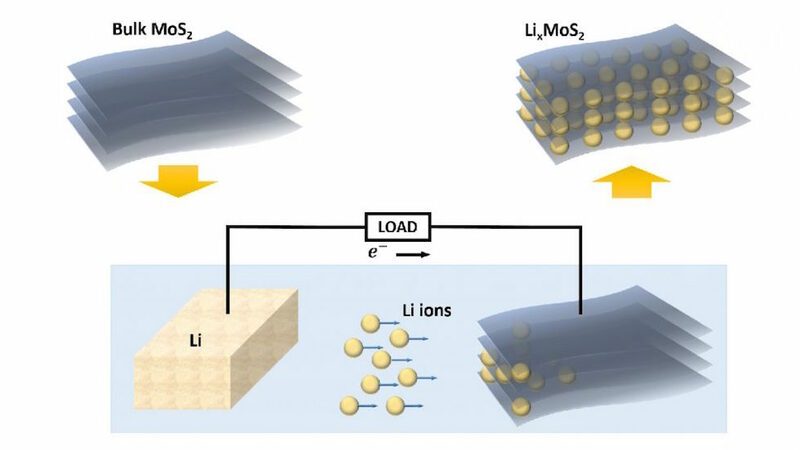 The presence of the lithium ions puts the layers of the 2D material out of alignment with each other, and it forces the MoS2 to rearrange the structure of its component atoms. When the ratio of lithium ions to MoS2 reached 0.34, the in-plane thermal conductivity was 45W/mK, and the out-of-plane thermal conductivity dropped to 0.4W/mK- increasing the material’s thermal anisotropy ratio from 50 to more than 100. Heat became more than twice as likely to travel in plane along the layer, rather than between the layers. Adding fewer lithium ions made the thermal anisotropy ratio lower, whilst adding more ions also made it lower. In both cases, the ratio was affected in a predictable way, so the team could tune the material’s thermal conductivity and thermal anisotropy ratio. The paper, “Tuning Thermal Conductivity in Molybdenum Disulphide by Electrochemical Intercalation,” is published in the Nature Communications.